UFC® welterweight champion Georges St-Pierre has posted an impressive 10-fight win streak during his reign atop the 170-pound division. On Saturday, March 16, he will look to extend that streak by one more as he steps back into the Octagon® in his hometown to face former STRIKEFORCE® champion Nick Diaz at Montreal’s Bell Centre. On the heels of unifying the welterweight title in November 2012 after an 18-month absence due to injury, St-Pierre (23-2) requested the fight against his fiery rival Diaz (27-8-1, fighting out of Stockton, California), telling UFC President Dana White it was “unfinished business.” Diaz agreed. The Ultimate Fighting Championship® will host a press conference on January 23 in Montreal with the main event stars, as tickets for UFC® 158: ST-PIERRE vs. DIAZ go on sale to the general public on Saturday, January 26 at 12 p.m. ET at evenko.ca and the Bell Centre box office. This press conference will also be streamed live on UFC.com. Fans are to use the Bell Centre main entrance (doors at 9:30 a.m.). In a compelling welterweight co-main event, Rory MacDonald (14-1, fighting out of Montreal, Canada) will get his shot at redemption as he aims to avenge his only career loss against former interim UFC welterweight champion Carlos Condit (28-6, fighting out of Albuquerque, N.M.). The duo met at UFC 115 in a Fight of the Night bout that saw Condit come from behind and register a TKO win with seconds remaining in the third round. MacDonald comes into the fight after a dominant decision win over UFC legend BJ Penn at UFC on FOX 5 in December. Meanwhile, Condit looks to re-establish his prominence at 170 pounds after an incredible battle with St-Pierre in November. Completing the welterweight triple-header on the main card, power-punching wrestler Johny Hendricks (14-1, fighting out of Dallas, Texas) meets former US Marine Jake Ellenberger (28-6, fighting out of Lake Forest, Calif. by way of Omaha, Neb.) in a bout with title implications. The hard-hitting Hendricks is confident of his standing in the 170-pound division and looks to add a sixth consecutive win on March 16 to solidify his place as number one contender. In addition to Montreal’s St-Pierre and MacDonald, six other Canadians will step into the Octagon® at UFC 158 including Calgary’s Nick Ring (13-1) who faces middleweight Chris Camozzi (18-5, fighting out of Lakewood, Colo.) on the main card. Ring was originally scheduled to face Costa Philippou at UFC 154 but had to withdraw at the last minute due to an illness. Camozzi has won three straight, earning his last win via unanimous decision over Luiz Cane. Making his debut at welterweight, hometown favorite Patrick Côté (19-8) will square off against former STRIKEFORCE fighter Bobby Voelker (24-8, fighting out of Kansas City, Kan.) who will be making his UFC debut. Côté is coming off a disqualification win against middleweight Alessio Sakara at UFC 154, while Voelker comes in on a three-fight win streak. Other Canadians in action are Jordan Mein (26-8, fighting out of Lethbridge, Alberta) who will make his UFC debut against veteran Dan Miller (16-6, 1 NC, fighting out of Whippany, N.J.), while Toronto’s Sean Pierson (13-6) battles welterweight Rick Story (14-6, fighting out of Vancouver, Wash.), Montreal’s John Makdessi (9-2) returns against Daron Cruickshank (12-2, fighting out of Detroit, Mich.) and Montreal’s Yves Jabouin (18-8) challenges bantamweight Johnny Eduardo (26-9, fighting out of Rio de Janeiro, Brazil). Additional bouts for UFC 158 will be announced in the days to come at www.ufc.com. Tickets for UFC® 158: ST-PIERRE vs. DIAZ go on sale Saturday, January 26 at 12 p.m. ET and are priced at $600, $350, $250, $200, $165, $115 and $85. Tickets will be available at the Bell Centre box office, by phone at (514) 790-2525 / 1-877-668-8269 or at evenko.ca. UFC® Fight Club™ members will have the opportunity to purchase tickets to this event on Thursday, January 24 at 10 a.m. ET via the website ufcfightclub.com. A special Internet ticket pre-sale will be available to UFC newsletter subscribers on Friday, January 25, starting at 10 a.m. ET. To access this presale, users must register for the UFC newsletter through UFC.com. 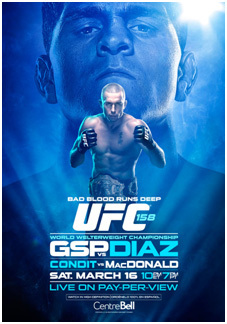 UFC® 158: ST-PIERRE vs. DIAZ will be available live on Pay-Per-View at 10 p.m. ET/7 p.m. PT on UFC.TV, iN DEMAND, DirecTV, DISH Network, Avail-TVN, and in Canada on BellTV, Shaw Communications, Sasktel, and Viewer’s Choice Canada for a suggested retail price of $44.99 US/$49.99 CAN for Standard Definition and $54.99 US/$59.99 CAN for High Definition.